Introduction and International Comparison. Editor's Introduction and Summary (M. Henrekson, J.A. Lybeck). 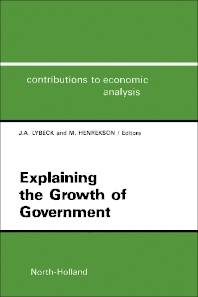 Explaining the Growth of Government: International Perspectives (B.S. Frey). Comparing Government Growth Rates: The Non-Institutional vs. the Institutional Approach (J.A. Lybeck). Permanent Income, Rational Expectations and Government Consumption: A Multi-Country Study (V.K. Borooah). Public Expenditure Decision-Making: A Comparative Analysis (T.R. Cusack). Country Studies. Swedish Government Growth: A Disequilibrium Analysis (M. Henrekson). Fiscal Behaviour and the Growth of Government in The Netherlands (P.S.A. Renaud, F.A.A.M. van Winden). The Expansion of the Public Sector in Denmark – A Post Festum? (M. Paldam, H.E. Zeuthen). The Growth of Public Expenditure in Italy since The Second World War (G. Brosio, C. Marchese). The Growth of Public Expenditure in France (C. Aubin et al.). The Growth of the Public Sector in Austria: An Exploratory Analysis (R. Neck, F. Schneider). The Growth of Public Spending in Norway 1865-1985 (R.J. Sørensen). The Growth of Public Expenditure in the United Kingdom, 1960-86 (V.K. Borooah). Government Spending in Federal Systems: A Comparison between Switzerland and Germany (G. Kirchgässner, W.W. Pommerehne). The Finnish Public Sector: Its Growth and Changing Role in 1960-1984 (I. Heiskanen, T. Martikainen). Indexes. The aim of this book is to explain the post-war growth of the public sector in a number of developed economies. The purpose is to see whether scientists familiar with their respective countries' institutional, political and economic framework, but still working as a group, can advance some common factors behind the growth of government.